I’m a big believer in using white noise machines for babies! They play an important role in good sleep hygiene for babies. Read on for my list of the best sound machines for babies, and how to use white noise in the nursery. Some babies can sleep through anything (so I’ve heard), but most babies prefer the shushing and comforting sound of white noise. I recommend using white noise machines for babies because they naturally help babies connect their sleep cycles by offering a constant, womb-like sound in the background. Honestly, our noise machines are a life saver and I strongly suggest that everyone have one in their nursery. Here’s my guide to the best white noise machines for babies. Do Babies Need White Noise to Sleep? 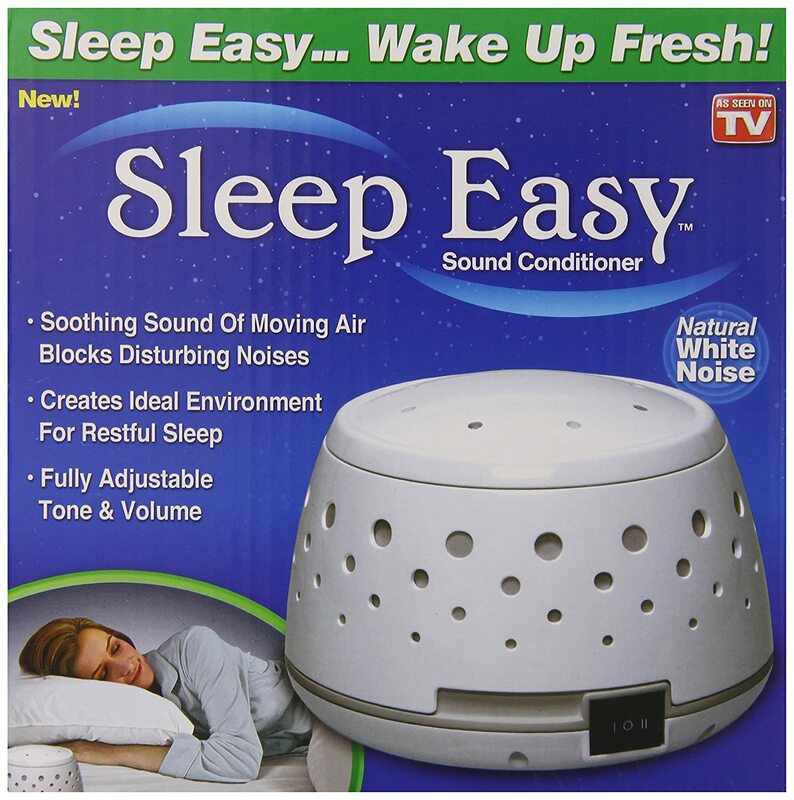 What Should You Look for In a White Noise Machine? I recommend using a white noise machine for babies from birth because it masks background noises while your baby sleeps. Do you plan to wash the dishes while baby sleeps? Take a shower? Walk down the stairs? Do you have creaky hardwood floors? All of this can potentially wake up your little one before they’re done napping – more so if they are a light sleeper. Additionally, white noise machines have been found to help babies to better connect their sleep cycles. What does this mean? If it helps your baby, it means that they will be able to go from one sleep cycle to the next; so, rather than waking up at the 45-minute mark, they might sleep a second cycle for a total of 90 minutes of nap time. However, I strongly suggest that all parents avoid using mobile phone apps to generate white noise. First, this exposes your baby to unwanted radiation (EMF) from the cell phone. And not to mention, it ties up your phone. 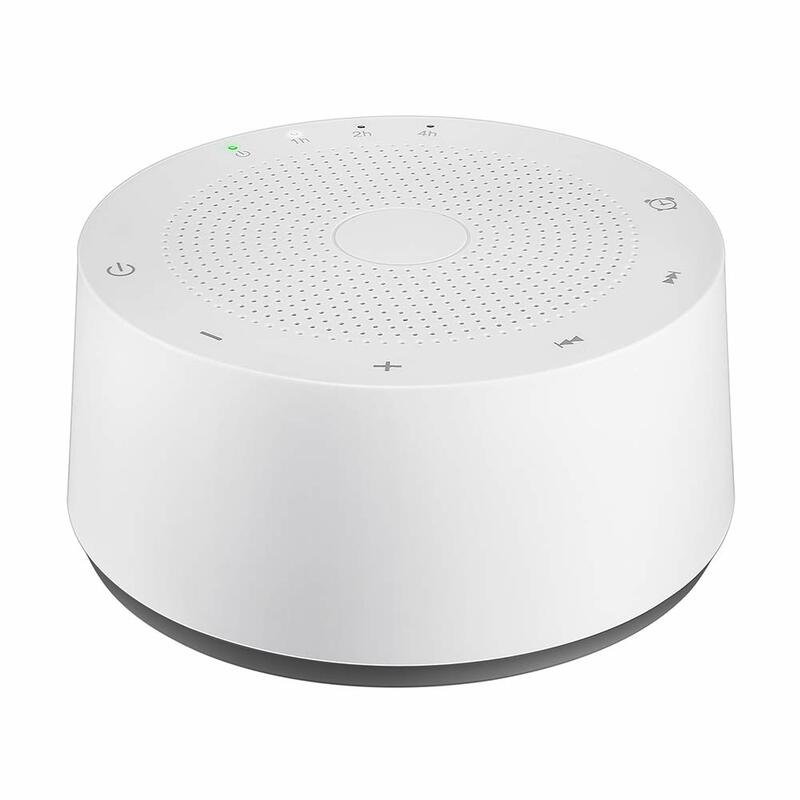 When shopping for white noise machines for your baby, it’s best to get one that truly and naturally makes white noise and isn’t playing a recording of white noise (or worse, music or lullabies). Also, it’s best to select a white noise machine that doesn’t automatically turn off after a set period of time. Some noise machines shut off after 15-45 minutes, and though this may have helped your baby fall asleep, it doesn’t help your baby stay asleep and connect those sleep cycles. Please note that you must keep any white noise machine at least 5 feet away from your baby so as not to cause any damage to their hearing. Here are the top three white noise machines I recommend for babies. This is my #1 recommendation and the sound machine that we use in our home. The Marpac DOHM is the best sound machine out there, and it’s even the official sound machine of the National Sleep Foundation. The reason this is recommended is because it has an actual fan inside, making this true white noise, as opposed to simply playing a recording of white noise. The DOHM does not automatically shut off and can be left on overnight. At about half the price of the Marpac, the Sleep Easy Sound Conditioner is a lesser-priced option that offers similar features. I haven’t tried this myself, but it has good reviews from other parents on Amazon. We use the DOHM for the most part in our home, but I got the chance to try out the Avantek and I was actually impressed. It isn’t a natural fan like the DOHM, but it has some really cool features. This is the sound machine I use when we travel or stay at grandma’s. The Avantek plays 6 different fan sounds, 13 calming nature sounds (like a calming rainfall), and 5 ambient sounds (like a heartbeat). It has a timer option, so you can set it to run anywhere between 1-7 hours, or you can just keep it running until you decide to turn it off. It comes with a USB charging cable and has a battery that can last for up to 10 hours of runtime. This makes it great if you plan on traveling a lot and don’t want to have two different sound machines. Overall, I am really impressed and think this is a great option for a sound machine for parents who are looking for the extra features. 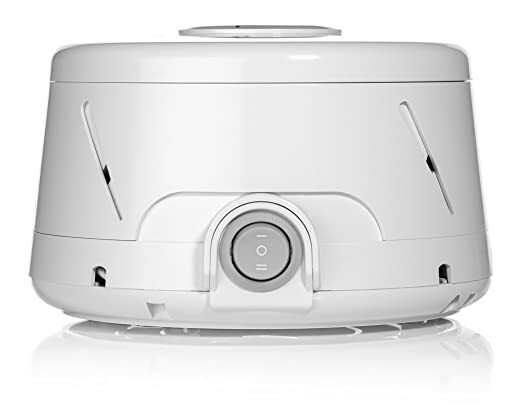 Take 10% off your Avantek white noise machine at Amazon with my coupon code GNURSERY. In the early weeks, newborns are so sleepy that they’ll fall asleep almost anywhere. They have very short waketimes and are almost always ready to sleep. Most babies will fall asleep in the car seat, in their stroller, in their bassinet, and even in the living room while the TV is on and your dog is barking. This is great because it gives you plenty of flexibility to get things done around the home, to get some rest yourself, and to get out of the house. You’ll be accustomed to them falling asleep anytime you get them in the car seat and the car is moving. (Note: a lot of babies will cry when you stop at a red light and stop crying when the car is moving. This is normal!) As they outgrow this sleepy phase, you will see that your baby has longer waketimes and that they might not fall asleep simply because the car or stroller are in motion. This is where a portable white noise machine comes in handy! 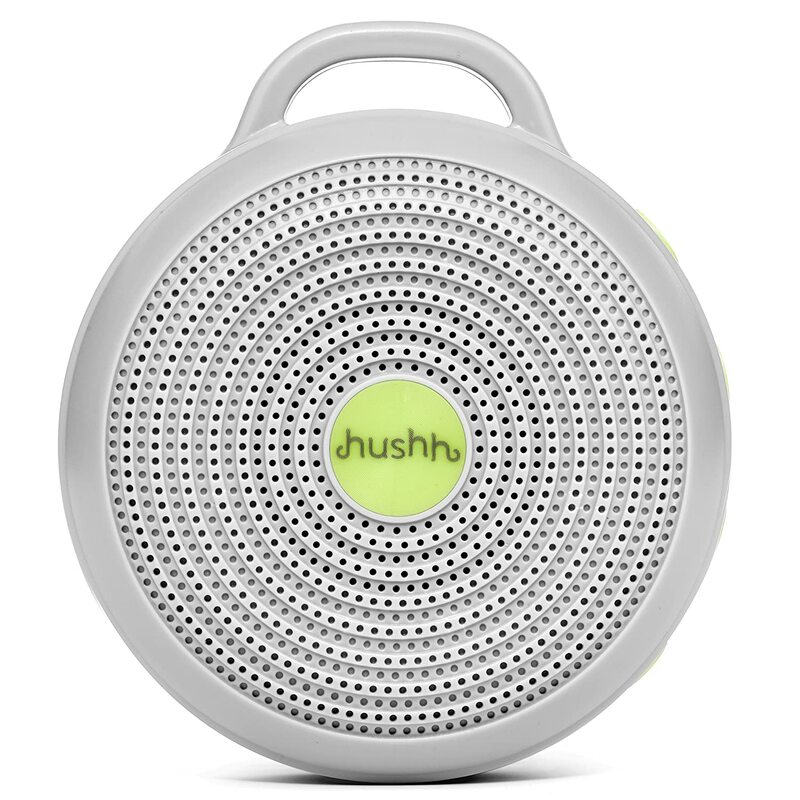 I am so sad that I only discovered portable white noise machines with my second baby, because they are such a life-saver. This is another absolute must for all new parents and it also makes a great baby shower gift. 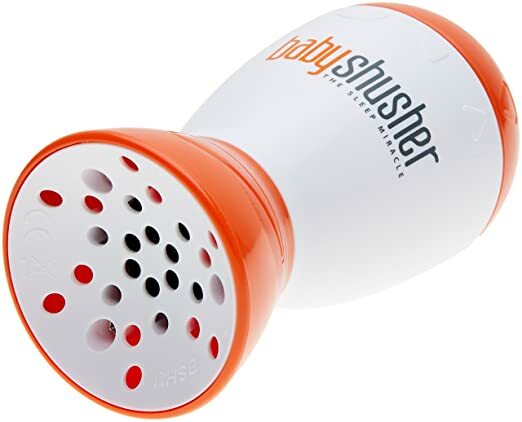 I began using this portable white noise machine with my second baby at around 3 months of age, when he started outgrowing that sleepy newborn phase and paying more attention to the world. When he’s due for a nap and is starting to get cranky, all I do is turn this on and place it near his car seat or in his stroller. The shushing sound, combined with the movement of the stroller or car seat, gets my baby to sleep in a few minutes’ time — almost every time. Even if my baby isn’t tired, the shushing sound will calm him when he is being fussy. It has a 15- or 30-minute setting and you can also control the volume, so this would be equally good to keep in your diaper bag or to take on an airplane. Truth: I keep mine in my diaper bag at all times! Made by Marpac, the Hushh is a portable sound machine that can be fastened to the stroller or car seat for soothing sounds on the go. It comes with three sound settings: bright white noise, deep white noise, and a gentle surf sound. It uses a USB cable for charging and can run all night long on a single charge. Which white noise machines did you choose? Hi Emily! Thank you so much! That’s so kind of you and I really appreciate the recognition. <3 Please send me a link and I will check it out.